The Extreme Ultraviolet and X-ray Irradiance Sensors (EXIS) on the GOES-R Series satellites are critical to understanding and monitoring solar irradiance in the upper atmosphere, that is, the power and effect of the sun’s electromagnetic radiation per unit of area. EXIS is able to detect solar flares that could interrupt communications and reduce navigational accuracy, affecting satellites, high altitude airlines and power grids on Earth. On board EXIS are two main sensors, the Extreme Ultraviolet Sensor (EUVS) and the X-Ray Sensor (XRS), which help scientists monitor activity on the sun. 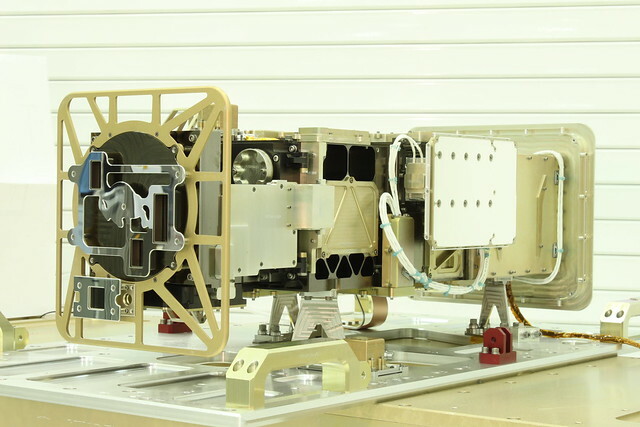 EXIS resides on the Sun-Pointing Platform (SPP) of the satellite, mounted in the yoke of the solar array. The instrument also includes the EUVS/XRS Electrical Box (EXEB) and the Sun Positioning Sensor (SPS) subsystems. NOAA requires the real-time monitoring of the solar irradiance variability that controls the variability of the terrestrial upper atmosphere (ionosphere and thermosphere). This requirement supports NOAA’s space weather operations and is implemented with XRS and EUVS. XRS monitors solar flares and helps predict solar proton events that can penetrate Earth’s magnetic field. The XRS is important in monitoring X-ray input into the Earth's upper atmosphere and alerts scientists to X-ray flares that are strong enough to cause radio blackouts and aides in space weather predictions. This is different from the SUVI instrument which takes extreme ultraviolet images of the sun to monitor features on the sun as well as flares and coronal mass ejections. EXIS provides more information on solar flares and includes a more complete and detailed report of solar variability than what is available from the previous generation of GOES. The EUVS measures changes in the solar extreme ultraviolet irradiance which drive upper atmospheric variability on all time scales. EUV radiation has major impacts on the ionosphere. An excess can result in radio blackouts of terrestrial high frequency communications at low latitudes. Large solar flares increase the EUV energy deposited in the earth’s upper atmosphere (thermosphere) which causes increased atmospheric drag on satellites in low Earth orbit. EXIS provides data to the NOAA Space Weather Prediction Center for warnings of radio blackouts. This aids in preserving ground-based radio communications and navigation systems.